I finished all of my nursing pre-reqs somewhere towards the end of December and decided that in my 3 months off, I would work on all sorts of creative projects. I feared that once I am a nurse I will push the creativity out of my life and I wanted to immerse myself in it for a few months just to ensure that I would establish it as a part of my life forever. As a kid, I loved to do anything artistic. I painted, I took pottery classes, anything and everything. My mom is an amazing artist and I wanted to be just like her. I had been taking art classes in school for as long as I can remember and then continued on to major in it in college. So for all these years, art has been somewhat of a chore… I mean, it was homework. It was always homework. So when I lost my job last August, I chose a new path for myself. It was a tough decision to make, but my best friend Tracy (plug: link to her photo blog to your right) put it to me simply… She asked me if I wanted to keep this interest I have in diseases (I always loved to research pathology) as a hobby or make it my career, or keep creative as my career or make it my hobby. It seemed so obvious to me after that. So here I am going back to school to be a nurse and eventually a nurse practitioner, and currently sitting here creating my first blog post for all my creative hobbies. My sister got me a sewing machine for Christmas last year (2008), and I didn’t spend too much time figuring it out until the end of the year. So after sewing some minor things like making old halter tops into normal strapped tops, and cinching in some shirts that were too big for me, I decided to sit down and work on some real fun stuff.. little things I could start to make as gifts for friends. Sewing has now become a serious passion. It is probably the most fun thing anyone could ever get involved in! I can’t imagine being without my machine, and absolutely just love sharing my ideas with everyone. Hopefully one day I can get good and start selling things on Etsy. My first project was a little wallet, or card holder. As you can see, my stitching is horrendous, but it was my very first! 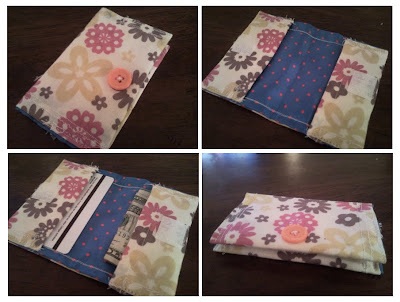 I have since figured out a much smarter way to make this same wallet. I gave this one to my sister for Christmas. Sorry for the poor quality photos, they were taken with my cell phone. About a week before Christmas, I attempted to have a Christmas Cookie Baking Party, however a huge snowstorm came and dumped 2 ft of snow on us, so only one person made it. 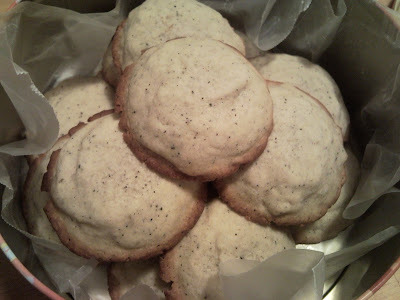 Anyway, it was the first time I ever made cookies from scratch, and I was surprised at how well they turned out! So I continued to make cookies for the next few weeks and for Christmas I invented Chai Tea Cookies with Crystallized Ginger. Before having people over (which never happened) I wanted to get some stuff together in my apt. One of the things I had been meaning to do was to run out to ikea and buy these little $10 wooden stools that I could line up by the coat closet to look like a bench, but there would be three separate ones so that they can be used as extra seating as well. 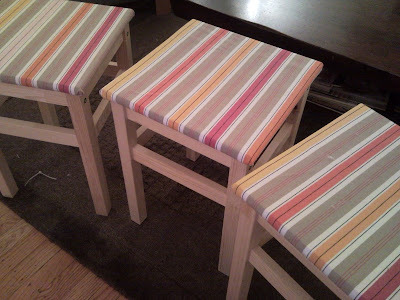 Well I bought them and decided to cover the seat portion of it with some striped fabric also from ikea. I love the way they turned out. They are cute and cheap, and just add a little something extra to my living room. And who doesn’t love wrapping gifts?! I love it, and on Christmas Eve, I was bored at Mom & Dad’s and they asked me to wrap their gift to Nate, so here is what I came up with… I thoroughly enjoyed making a faux bow and adding his name to the gift as well. I hope you enjoy my new blog! Constructive criticism is always welcome!! This entry was posted on January 25, 2010. It was filed under Baking, Sewing.